This large, colorful storybook can be used to keep young students engaged and focused on the main concepts of the lesson and story. With dimensions of 15" x 19½", it fits easily on standard easels available in most early childhood classrooms. 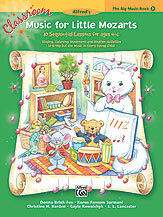 The pages in the Big Music Book correlate carefully with the lesson plans contained in the Classroom Music for Little Mozarts,/i> Curriculum Book 3 (see item 00-27612).